Freedom is the essence of good life. Freedom to live, love, express and share with no artificial limitations. Freedom to live your life the way you want to live it without harming others. Freedom to feel included – normal even. Freedom to make sense of the world in your own terms. In today’s world freedom is again in jeopardy. In the cyclic nature of global history, we find ourselves in a position where values and rights taken for granted in the Western world for generations are again questioned. Even somewhat attacked. Our ability to trust our leaders and one another is shattered. Helsinki is not immune to this change, even though we still watch it from a distance. Our desire to have a voice in the global discussion grows stronger as the values we hold dear are under a threat. Defending democratic values and trust-based society is deeply rooted in our willingness to connect openly with our own community and others. I have found that art is a powerful tool in this work. Throughout history artists have been the defenders of freedom and free expression. They have taken personal and social risks so that others might be enlightened. They have questioned the power structures and criticized leaders. Artists have always had a strong voice that people like to hear. Sometimes this voice is used to defend values, sometimes to raise criticisms, sometimes just to give pleasure and feed the soul. For me, a sign of a successful city and a healthy community has always been the presence of arts and culture in all of their formats. The Helsinki Art Museum has always been in the forefront of these conversations. As a true Helsinki institution their work is visible in the museum but also around the city – where public art is present in our everyday life. 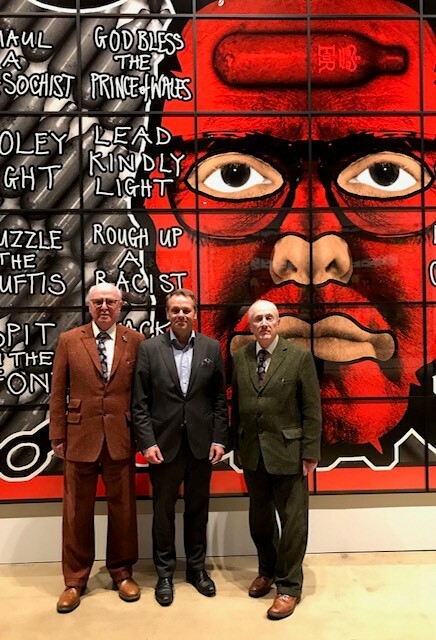 Gilbert and George are artists – or an artist – that have brought forward the most fundamental things that make us humans. They were not instantly successful, but believed in their work and their message and finally the world was able to listen. Today their work crystalizes many of today’s most complex conversations in a single item or a gesture. Many countries don’t allow them to exhibit. That is why I’m even more proud to open this exhibition today in Helsinki. This city is above anything else a community. Our strength lies in our ability to create the best possible conditions for the most forward-looking everyday life. Good life is in the core of everything we do. Sustainable, smart, creative and driven Helsinki has become larger than its physical appearance. We have a voice in the global conversations and what we do matter. Still we have to work harder every day to survive in the global competition between cities, where all want to attract the best people, investments and ideas. In this race trust is a major differentiating factor. Helsinki’s relevance stems partly from our ability to create trust between the city and its community. Trust inspires creativity. Trust allows to take risks and crab opportunities. Art and artists have always pointed towards the interesting, the wrong, the brilliant. It is our job as humans, art lovers and city leaders to understand that message and follow it. My mission is to make Helsinki a place where we encourage art and culture in all of its formats and expressions. Where all are free to interpret, share and experience on their own terms and with the people of their choosing. Where art will always have a home and a voice. The only thing I as a mayor ask in return is that you keep us awake. Keep us in check. Make us care.